John, or Jack as he was known, was younger brother to Reginald William Essex and cousin to George Douglas Essex, who also appear on the Wincle Memorial. Jack was born on 27th November 1896 in Much Cowarne, Herefordshire, where his father, Edward, was schoolmaster. He moved with his parents and eight siblings to the School House in Wildboarclough in 1899 when his father was appointed to the school there. They were living at Longdale Cottage, Wincle, when Jack enlisted in the King's Royal Rifle Corps, right at the beginning of the war on 6th August 1914, as rifleman 6/1075. He spent his 18th and 19th birthdays in the trenches and took part in the battles at Neuve Chapelle (10-15th March 1915) and Loos (25th September -18th October 1915). 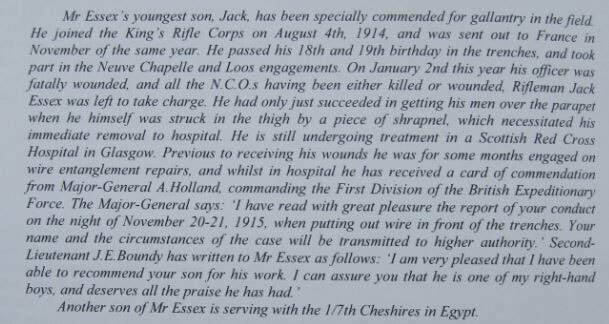 Jack was specially commended for gallantry in the field for pulling out wire in front of the trenches on the night of 20th/21st November 1915 and was subsequently mentioned in dispatches on 15th June 1916. He was wounded on 30th December 1915 following an action when he had to take command of his troops over the top following the death of both his commanding officer and all NCOs. Jack was repatriated and spent time in hospital in Glasgow recovering. He was subsequently transferred to the Northamptonshire Regiment (service no. 30161) but in January 1917 he was discharged from the army and issued with a Silver War Medal; presumably he had been wounded again or his old wound was still causing problems. He was later awarded the Victory Medal, the British War Medal and the 1914-15 Star. After the war he became a crane driver on the railways. He married Maud Franklin in 1919, and settled near Manchester where they had three daughters. Jack died in 1976.